Ronald Dietrich Asmus (June 29, 1957 – April 30, 2011) was a United States diplomat and political analyst. He, as U.S. Deputy Assistant Secretary of State for European Affairs (1997–2000), was instrumental in the expansion of NATO to include former members of the Eastern bloc and acted as a leading policy designer in the U.S.–Europe relations. Asmus was born to a family of German immigrants who came to Milwaukee, Wisconsin after World War II. He grew up in Milwaukee and Mequon, Wisconsin graduating from Homestead High School. Asmus was an early and strong proponent of expanding NATO into Eastern Europe. He was U.S. Deputy Assistant Secretary of State for European Affairs in the Clinton Administration from 1997 to 2000. He played an important role in the 1999 Washington summit of NATO, when Poland, the Czech Republic and Hungary joined the Alliance. He was also a senior analyst and fellow at Radio Free Europe, RAND and the Council on Foreign Relations. For his diplomatic work, Asmus was decorated by the US Department of State and the governments of Estonia, Georgia, Italy, Latvia, Lithuania, Poland, and Sweden. Asmus held a PhD in European Studies, a master's degree in Soviet and East European studies from the Paul H. Nitze School of Advanced International Studies of the Johns Hopkins University, and a BA in political science from the University of Wisconsin–Madison. He was the Executive Director of the Brussels-based Transatlantic Center and was also responsible for strategic planning at the German Marshall Fund of the United States. Asmus authored Opening NATO's Door: How the Alliance Remade Itself for a New Era (Columbia, 2002), about the push to open NATO to Eastern European countries, and A Little War that Shook the World (Palgrave Macmillan, January 2010), about the conflict between Russia and Georgia in 2008. Being one of the most persistent advocates for the integration of Georgia into the European Union and NATO, Asmus viewed the conflict in terms of a larger Russia–West relations and argued that it was Georgian independence, and its Westward orientation, which angered Russia and set the groundwork for war. Asmus died of a lung cancer-related illness in Brussels on April 30, 2011. The U.S. Department of State, governments of the Baltic states  and Georgia expressed their condolences over the death of Asmus. ^ a b c "Ron Asmus, R.I.P." Radio Free Europe/Radio Liberty. May 3, 2011. Retrieved 3 May 2011. ^ a b c Clinton, Hillary Rodham (May 3, 2011). "Passing of Ronald Asmus". U.S. State Department. Retrieved 3 May 2011. ^ a b "Ronald D. Asmus". Lecturer Class of Spring 2010. The American Academy. Retrieved 3 May 2011. ^ "Baltics mourn Ronald Asmus". The Baltic Times. May 3, 2011. Retrieved 3 May 2011. ^ "Traditional briefing of the Spokesperson for the President of Georgia". Administration of the President of Georgia. Retrieved 3 May 2011. Atlanticism, also known as Transatlanticism, is the belief in or support for a close relationship between the United States and Canada, on one hand, and European countries on the other, regarding political, economic, and defence issues, in the belief that it would maintain the security and prosperity of the participating countries and protect the perceived values that unite them. The term derives from the Atlantic Ocean that separates North America from Europe. Andrey Vladimirovich Kozyrev was the first Minister of Foreign Affairs of the Russian Federation under President Boris Yeltsin, in office from October 1991 until January 1996. In his position he was credited with developing Russia's foreign policy immediately after the fall of the Soviet Union, although many in Russia have criticized him for being weak and not assertive enough in defending Russian interests in the face of the United States and NATO in places like Bosnia and Iraq. For this he took a lot of criticism from the nationalist politicians and parties. Kozyrev had graduated from the Moscow State Institute of International Relations (MGIMO) with a Ph.D. in history before joining the Soviet Ministry of Foreign Affairs in 1974, holding various positions in it before being appointed foreign minister. Alexander Russell "Sandy" Vershbow is an American diplomat and former Deputy Secretary General of the North Atlantic Treaty Organization. Russian–European Union relations are the international relations between the European Union (EU) and its largest bordering state, Russia, to the east. The relations of individual member states of the European Union and Russia vary, though a 1990s common foreign policy outline towards Russia was the first such EU foreign policy agreed. Furthermore, four European Union-Russia Common Spaces are agreed as a framework for establishing better relations. The latest EU-Russia strategic partnership was signed in 2011, but it was later challenged by the European Parliament in 2015 following the annexation of Crimea and the war in Donbass. Russia–United States relations refers to the bilateral relationship between the United States and Russia since 1991. The United States and Russia maintain diplomatic and trade relations. The relationship was generally warm under the Russian President Boris Yeltsin (1991–99) until the NATO bombing of the Federal Republic of Yugoslavia in the spring of 1999, and has since deteriorated significantly. In 2014, relations greatly strained due to the crisis in Ukraine, Russia's annexation of Crimea in 2014, differences regarding Russian military intervention in the Syrian Civil War, and from the end of 2016 over Russia's alleged interference in the 2016 U.S. elections. Mutual sanctions imposed in 2014 remain in place. Georgia and North Atlantic Treaty Organization (NATO) relations officially began in 1994 when Georgia joined the NATO-run Partnership for Peace. Georgia has moved quickly following the Rose Revolution in 2003 to seek closer ties and eventual membership with NATO. Georgia's powerful northern neighbor, Russia, has opposed the closer ties, including those expressed at the 2008 Bucharest summit where NATO members promised that Georgia would eventually join the organization. In the 7 December 2011 statement of the North Atlantic Council Georgia was designated as an "aspirant country". Denmark–United States relations refers to the current and historical relations between Denmark and the United States. Denmark has an embassy in Washington D.C. The United States has an embassy in Copenhagen. Denmark has a trade office in Atlanta, Georgia. and a consulate general in New York City. Both countries are members of NATO. Enlargement of the North Atlantic Treaty Organization (NATO) is the process of including new member states in NATO. NATO is a military alliance of twenty-seven European and two North American countries that constitutes a system of collective defense. The process of joining the alliance is governed by Article 10 of the North Atlantic Treaty, which allows only for the invitation of "other European States", and by subsequent agreements. Countries wishing to join have to meet certain requirements and complete a multi-step process involving political dialogue and military integration. The accession process is overseen by the North Atlantic Council, NATO's governing body. Relations between Ukraine and North Atlantic Treaty Organization (NATO) started in 1994. 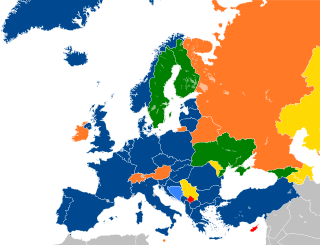 Ukraine applied to join the NATO Membership Action Plan (MAP) in 2008. Plans for NATO membership were shelved by Ukraine following the 2010 presidential election in which Viktor Yanukovych, who preferred to keep the country non-aligned, was elected President. Amid the Euromaidan unrest, Yanukovych fled Ukraine in February 2014. The interim Yatsenyuk Government which came to power initially said, with reference to the country's non-aligned status, that it had no plans to join NATO. However, following the Russian military invasion in Ukraine and parliamentary elections in October 2014, the new government made joining NATO a priority. Richard L. Kugler is an American thinker and writer on U.S. national security policy and defense strategy. The accession of Montenegro to NATO (NATO) took place on 5 June 2017. In December 2009, Montenegro was granted a Membership Action Plan, the final step in an application for membership in the organization. A formal invitation was issued by the alliance on 2 December 2015, with accession negotiations concluded with the signature by the Foreign Ministers of an Accession Protocol on 19 May 2016. Montenegro officially joined NATO on 5 June 2017. The Joint Baltic American National Committee, Inc. (JBANC) is a non-profit organization that monitors issues affecting Baltic-American communities in the United States and the nations of Estonia, Latvia, and Lithuania. JBANC functions as the public affairs bureau for its three parent organizations, the Estonian American National Council (EANC), the American Latvian Association, Inc. , and the Lithuanian American Council, Inc. (LAC). The organization was founded on April 27, 1961 through a joint proclamation by Estonian National Committee in the U.S.A. Chairman Julius Kangur; American Latvian Association, Inc., in the United States President Peter P. Lejins; and Lithuanian American Council, Inc., President Leonard Simutis. NATO logistics in the Afghan War refers to the efforts of the North Atlantic Treaty Organization to deliver vital fuel, food, hardware and other logistic supplies to Afghanistan in support of the War in Afghanistan (2001–present). Logistics operations took place under the auspices of the International Security Assistance Force from 2001 to 2014, then under the Resolute Support Mission from 2015 on.